Trump Made 2 Big Moves This Past Week To Reshape The Affordable Care Act : Shots - Health News Frustrated that Congress hasn't repealed the Affordable Care Act, the administration continues to make moves that chip away at the ACA's nationwide protections and give states more control. 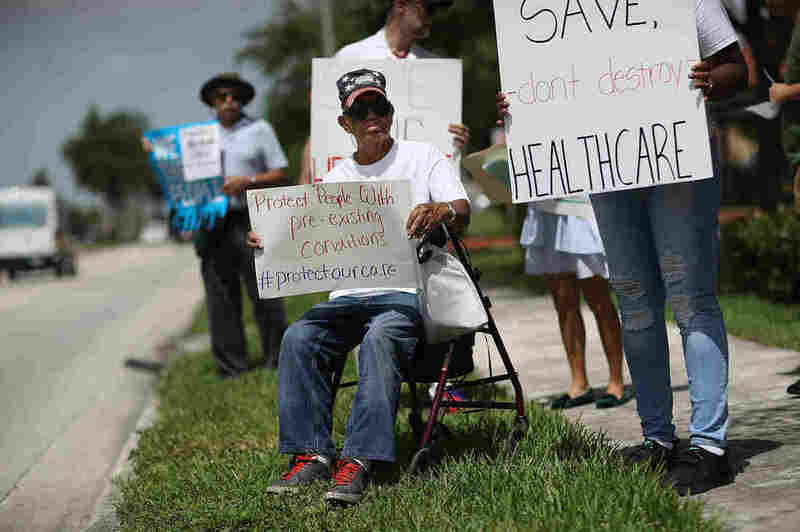 Shelton Allwood joined other demonstrators in Miami last year calling for continued protection for people who have pre-existing medical conditions. In a span of less than 24 hours this past week, the Trump administration took two seemingly contradictory actions that could have profound effects on the insurance marketplaces set up by the Affordable Care Act. So what expectations should consumers have? Analysts say there are three key takeaways. The move is unlikely to benefit people who have chronic health problems, because short-term plans are allowed to reject people with pre-existing conditions or to decline to cover care for those medical problems. Administration officials estimate such plans could draw 600,000 new enrollees next year, and others have estimated the numbers could be far higher. The concern is if many healthy people in 2019 switch out of the ACA market and choose short-term plans instead, premiums will rise for those who remain in the ACA market. That would hike premiums for people with pre-existing conditions. It would also make the ACA market less attractive for insurers and could lead them to stop offering plans on the exchange. Most states, for example, allowed insurers to reject applicants who have medical conditions such as diabetes, cancer, depression, Down syndrome or asthma. Currently, about 14.4 million people buy their own insurance, with about 10.6 million of those using federal or state ACA marketplaces. The others buy private plans through insurance brokers. "Most employers believe their group health plan will provide better health coverage than an individual market plan," Condeluci says. An earlier version of this story said that about 17 million people in the U.S. buy individual insurance policies, with about 10 million of those relying on the federal or state ACA marketplaces. The latest estimates of people who buy individual policies are actually closer to 14.4 million, with an estimated 10.6 million buying their health plans on the state and federal exchanges.